The sight of something that’s been stuck away somewhere for a long time can bring back a flood of memories. In this case, fortunately, those recollections are very pleasant. Over this summer our family’s been slowly working through stacks of stuff that have cluttered our basement, our garage, our attic, and our house for years. At first the task appeared to be completely daunting. By committing to filling a few large bags or so each time we tackled this chore, however, the progress has been steady and encouraging. Some bags go to the local Salvation Army outlet. Other bags join the weekly trash-pickup. Some stuff is rediscovered and retained, and sometimes placed in a new spot where it can be re-appreciated. For example, a shelf in my home office now includes two bits of golfing memorabilia found in my father-in-law’s ancient golf bag. One is a little pocket guide to golf. The National Golf Foundation published “The Easy Way to Learn Golf Rules” in 1965, written by Helen Slocum. Betty Daggett drew the little cartoons that accompany Slocum’s pithy commentary, designed to introduce golf novices to some of the basic rules and situations. The other item was carefully folded up and stuck inside the book. 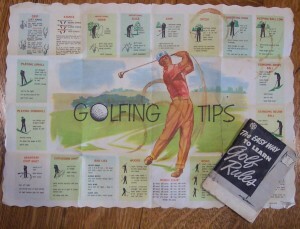 It is an undated paper place mat, with twenty different pieces of golf advice surrounding a drawing of a golfer completing his swing. There are three small round glass stains in the center. Among other bits, the place mat tells us to expect our #2 wood shot to travel 200 yards, while a ball hit with a #1 iron should go 180 yards. Few golfers today could tell anyone when was the last time they used a 2-wood or 1-iron, if they ever did. William Robinson, or Mr. Bill as I called him, was a retired Federal employee who loved all kinds of sports. A left-hander, he was apparently a very good baseball player before joining the Army in World War II. He returned to Philadelphia after the War and joined his fellow ex-GIs in making his way in the world. He took up golf, and frequently played the municipal courses all around Philadelphia. When we first met, years before I married his daughter, I didn’t play golf. That didn’t start until 1984 or so. By then, my wife and I and our infant daughter would join Mr. Bill and my mother-in-law on vacations on the Jersey shore, usually during the week after Labor Day. I was using my father’s old clubs, lugging them in a small Sunday bag, and buying cheap X’d-out golf balls that rarely lasted a few holes before they would disappear into ponds, forests, or swamps. This was especially likely when Mr. Bill and I would make our pilgrimage to the twelve-hole public par-3 golf course adjacent to the Ocean City, New Jersey airport. We’d pay our fee at the tiny pro shop and walk out to the scruffy course, wearing a fragrant mix of sun screen and bug spray. I’d take my usual wild overswing and belt something somewhere closer to the green. Mr. Bill’s tempo was far milder, but not often much more accurate, thanks to the stiffening effects of his arthritis. Pars were nearly non-existent for either of us, and usually celebrated for their novelty. We usually didn’t talk too much during these rounds, other than the small stuff about where a topped drive or muffled approach might have landed. Even so, I think these rounds of golf helped the two of us learn more about each other than anything else we ever did together. Before we began playing golf on these jaunts, I used to think Mr. Bill and I didn’t have very much in common, except for the same birthday and a special place in our hearts for the same young woman. I came to appreciate him for his zeal for this and other sports, and for his ability to enjoy life as much as possible. He’s been gone now for fourteen years. I’m keeping these two mementos for what they help me recall about our time together.